We were recently in Piedmont for several days visiting family. We spent all of our time in the Cuneo province of Piedmont. One of our mothers who had never been to Italy was with us. She could speak Piedmontese well, remembering it from her childhood when it was spoken by Piedmontese immigrants in and around the Los Angeles area. The relatives we visited were surprised that someone from America could speak this language. 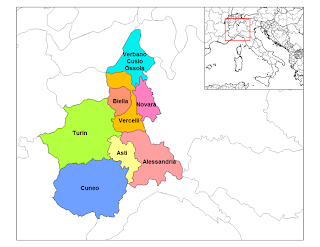 The Piedmontese language is still considered by some to be a dialect of Italian. In any case, there are enough similarities to the Italian language that after a few days we were starting to get the hang of it. A characteristic which sticks out for me is an aspect officially called the velar nasal N-sound where words come out sounding like the “ing” in “going”. Also, in comparison to Italian, Piedmontese seems to leave off the lasts syllable many in words: “adesso” (now) is “adess” and “giusto” (correct; right) becomes “giust”. There is also a noticeable French influence; “buon” (good) becomes “bon” and “sorella” (sister) is “seur” (pretty close to French). Mom would speak to relatives in Piemontese, relatives would speak to us in Italian, and we would speak to Mom in English. It was all a great workout for the brain. The relatives were able to even peg her accent as “southern” Piemontese as there is a high degree of variability within Piemonte in how the language is spoken. The long title of the museum is “Museo Degli Usi e Dei Costumi Della Gente di Montagna”. The museum was created by the owners of the B&B Pietrabruna in 1987. Families in the area of Serra-Pomparato donated heirlooms to build the collection. It is always open by appointment. If you let Giovanna, the owner of Pietrabruna know a day in advance you can enjoy a personal tour of the museum with her the next morning. The museum is open in July and August without appointment. There is no charge to enter this museum, but donations are accepted. The museum recreates typical rooms of houses of the 17th century including a kitchen, bedroom, and school room. There are rooms in the museum showing all sorts of typical everyday items and especially farming and household implements for working with chestnuts. Chestnuts were a main form of sustenance for the people of this area for a long time. Today the Fiera Regionale del Marrone (Chestnut Fair) marks this importance every Fall in Cuneo. Another nice thing about the museum is that many items are labeled in both Italian and Piedmontese so in the least you can improve your vocabulary. We were treated to a sumptuous lunch at the l’Ostu d’r Chié in Frazione Prea – Via Fontana, Roccaforte. The location in the small town of Prea in Piemonte (Cuneo) is charming and the food was great. The town has a number of murals painted on buildings so before or after eating it’s definitely worth a walk through the town discovering all of them. -- Monday, Villa Medici Fiesole. -- Tuesday, Villa Castello (Medici) and Boboli Gardens. -- Wednesday, three villas in the Lucca area: Villa Garzoni, Villa Torrigiani, and Villa Marlia. -- Thursday, Villa Le Balze and Villa Gamberia. Interspersed with the tours were a couple of lectures back at the library of the British Institute. Standout visits for me were Le Balze (built by an American philosopher Charles Strong), Gamberia, and La Pietra. To be fair, all of the places we saw had something to recommend them. Probably the weakest was Villa Garzoni because it was a bit Disney-esque and really didn’t have that much to see. What’s interesting to note is that many of the most famous villas around Florence are currently owned by American universities. Also, many were bought, restored, and made famous the end of the 19th century by Brits. So why so much focus on the villa? There are many reasons, but one which stuck out for me was the concept of “otium” which translates to something like “leisure with dignity”. The villa was a place you got your otium on, so to speak. During the course we learned to recognize the typical elements which made a Renaissance villa; a kit per se consisting of limonaia (greenhouse for citrus), secret garden, grotto, walking paths, green theater, water jokes, and other features. Of these elements, water jokes are the one feature which while still present, rarely work. It was with great surprise that we actually turned on the water jokes at Villa Marlia. We found the valves and let them rip. Everyone ran around wet and laughing – the purpose of the water jokes. 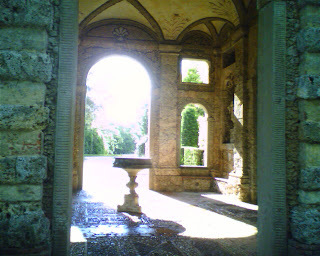 A cell phone image shows the grotto at Villa Marlia where you can turn on the water. Water comes from all directions from little hidden tubes. Even when you run out of the grotto, a couple of water streams hit you. No escape. By chance we learned that the Grande Grotto (or Grotto del Buontalenti) is now open in the Boboli Gardens – as in you can enter the grotto. At the top of the hour it is open for 15 minutes or so. (It might be wiser to not expect it to be open at lunch time….). We went around 4 pm and it was fun to walk in. We asked the guard what the plans were for water, because what’s a grotto without water? He said that there are plans to get the water running but first attempts revealed that there was something underneath the grotto (a nearby store’s storage we think) that was getting water damage after a couple of days. So, they have to address that issue first. The grotto was constructed in the last half of the 1500s and has three rooms. In the main room there are copies of Michelangelo’s prisoners. In the second room there is the sculpture by Vincenzo de Rossi, Paris and Helen and in the third room there is a sculpture by Giambologna, Bathing Venus. Finally after a little probing around we were able to figure out that it is the triquetra symbol which is used often in the internal marble design of San Miniato, or officially the Basilica di San Miniato al Monte. 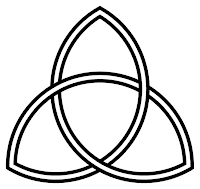 The one used here is three overlapping vesica pisces – which has a significance going back as far as Pythagoras and is probably related to the Catch of 153 fish in Gospel of John. So much for a casual stroll out and not hoping to think too much. This is the wonderful curse of Florence for us: symbols and endless exploration of meaning and relating what we find across time and place. San Miniato is a favorite of ours to spend time in and around. Today there was organ music for some time that we sat and listened to, and then the vespers (evening prayer service) started with the Gregorian chant which kept us lingering in the coolness of the basilica for another hour. Finally, released from the spell inside we stepped into the spell outside, the smell of jasmine wafting in the warm evening air and the city getting ready for evening. Today was a festival for Santa Rita de Cascia at Santo Spirito. Santa Rita (1381 – 1457) is an important saint for the Augustinians. Her celebration date is the 22nd of May, the day she died. She is often represented holding a crown of thorns, holding roses and figs. In Santa Spirito the Cloister of the Dead (Chiostro dei Morti) was open (which is unusual) and you could go there and make a small donation and get roses so everyone was walking around with roses. Also, the big center doors of the church were thrown wide open, again unusual. I guess we’ve been here enough that we get excited when there is a small change in the state of affairs of one of our favorite churches. One of our favorite walks is from Porta Romana to Piazza Ferruccia, walking through the Bobolino, taking Viale Galileo to Piazzale Michelangelo, and then Viale Michelangelo to Piazza Ferruccia. It takes about an hour walking moderately. For several weeks now I kept noticing a less than pleasant smell, like dog crap. Finally after trial and error sniffing around I tracked it down to a shrub that is commonly used along the sidewalk, Viburnum tinus. After some searching it seems that this shrub emits “… an offensive smell in wet weather.” Okay, didn’t think there were that many dogs in Florence. 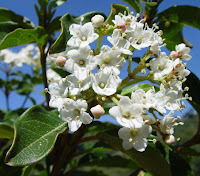 Viburnum tinus is also commonly called “laurustinus” and is native to the Mediterranean and Macaronesia regions. Here in Florence it is used extensively in hedges along sidewalks (outside the city) and in gardens like the Boboli. It is often mixed with Laurus nobilis (bay laurel) – which doesn’t smell bad. The other thing is that the Viburnum seems to be under serious attack by viburnum leaf beetle. I wonder if this contributes to the smell, that is, when the plant is under serious attack it releases a smell or the beetles themselves are releasing a smell? The festival called Artigianato e Palazzo – botteghe artigiane e loro committenze, and took place from the 16th through the 18th of May 2008 at Giardino Corsini. This festival of artisans seems to focus heavily on local artisans though you also find artisans from other parts of Italy as well as Europe. In general, this event is a fraction of what the Mostra Internazionale dell’Artigianato was in size, but “seems” to be a bit more exclusive. We stopped by to see “maestro” Roberto Marrucci and the wonderful world of pietra dura, mosaici fiorentini. See photo attached. The Giardino Corsini (satellite location) at Via della Scala, 115 is a 16th century garden that we hadn’t been in before. It seems faded on first glance but on closer inspection reveals itself to be an elegant space. The artisans were scattered all around the property. Some in the garden, some in the limonaie (citrus houses), some in open areas. 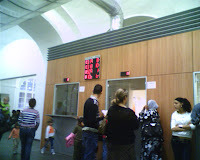 It costs 7,50 euro to get in. There is place to buy a lunch and sit down and eat. Look for it again next May. 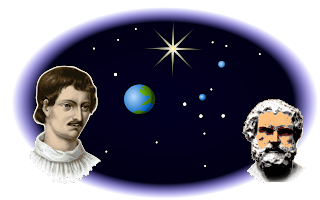 From the last post on this subject, you might recall that today was our “correct” day to go back for our permesso di soggiorno/i. (We weren’t successful the first time because were not prepared to wait 4+ hours.) 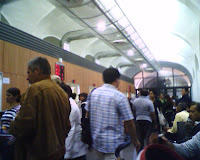 Today we arrived at about 9:10am and already the place was packed. There was some initial confusion about which line to get into but showing our letters (and the fact that we missed the first assigned date) put us in a line to get a “C” ticket. Last time it was a “B” ticket. But, oh, someone must pull the ticket from the machine and hand it to you. I guess it makes sense because there is so much pushing and shoving and confusion, people would just be taking one of every ticket to cover their options and the machine would probably break. So we got tickets C401 and C402. They were currently serving C318. So we sat and read and chatted. 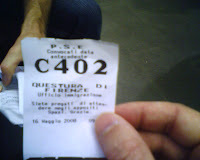 Then around 1:15pm our number got called, we went together and the clerk was fine to process us at the same time. For us since we filled out the kit properly (I guess) the clerk only had to see 1) our letter summoning us 2) our passport and 3) 4 passport-sized photos. It’s odd because the letter summoning us made it sound like we were missing all sorts of information. Maybe that’s because people come to these appointments (a term used loosely here) without having filled out the yellow kit? Who knows? After about 5-10 minutes for both of us the clerk sent us to window 17-18 around the corner to finish the processing. Silly us, we thought that we would get something like a card all laminated and stuff, hehehe. No such doings. We each got called up and they take all of your fingerprints electronically on this little glass surface, one-at-a-time. She kept yelling at me “schiacciate!” (press!) – ciao bella, I am pressing. Frustrated, she had me rub hands together. That seemed to work. Then you sign something attached to your photos and the big finale, drum roll please, you are handed a piece of paper telling you when to return for you card (see attached). For us it is August 20th. We’ll have been gone for several months. Oops. We were wondering if we should have told them we were leaving soon. You can try it, but we were guessing it would not speed up anything. So that’s it. -->Your letter is key, don’t lose it, and perhaps even make a photocopy of it. -->Get there early (questura opens at 8:30am? – verify! ), yes we knew that but were a bit leisurely with our breakfast and with restaurant hours (going to bed at 1:00am) we weren’t too eager to jump out of bed. --> Bring work to do or books to read. --> There are restrooms there but hope your quads are strong. --> Numbers start going quicker later in the day so be careful leaving and thinking they won’t reach your number that quickly. --> You can walk in and out of the place, but bring your ticket and letter to be on the safe side. --> Remember it’s the journey not the soggiorno. 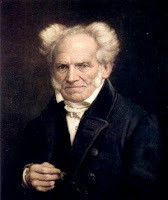 Thank you, I think, Mr. Schopenhauer. We hear the noise from this family (husband, wife, 2 year old) all the time since we are close, but it doesn’t bother us because we keep the same hours – plus it seems like “natural” noise (if you can define that). The noise of Anna of the Green Door and company is a different beast, an intentional, punctual and worst of all, slamming type of noise. 7:00am door slam, son leaves. 7:30am door slam, dad leaves. 8:00am door slam, morning sweeping completed. 8:15am swoosh and slam, a mysterious bucket of water is flung out followed by a resounding slam to make sure the door really shut well. 8:30 – 10:00am random door slams depending on if a dog owner was accosted in the alley and if the dog left a present in the alley. If the dog owner retraces steps with no chance of getting accosted you can hear her muttering “Cane sporca” or something to that effect. Each of these door slams for me is like someone coming over and kicking me. (I know, it’s my problem.) At least the family with the kid sleeps to 10am. I can deal with that. I’m not glad someone else was irked at noise, but watching the situation helped me understand my own reactions and put them into perspective better. Has the sabbatical been that life-changing that we’ve turned to the Great Philosophers for guidance? (By the way, who are the Not-So-Great Philosophers?) Yes, the sabbatical has been great and larger questions are getting asked, but the real reason Travelmarx is reading this book is that the book was found by randomly browsing book stacks in the bowels of the British Institute’s library. I guess, in a way, the sabbatical is directly responsible because what other time would I be in the bowels of a 16th century palazzo in Florence browsing books? 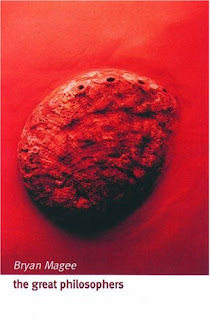 The book The Great Philosophers by Bryan Magee is the transcript of a series of conversations that Magee, a noted British politician, author, and popularizer of philosophy, conducts with 15 contemporary (circa 1980s) writers and philosophers to chart a course through Western philosophy. The format actually works better than you might think. The conversations are well-scripted with each speaker getting ample time to develop ideas. Magee is less interviewing than conversing and he often contributes a lot to simplifying the discussion for the layperson which is something he is particularly good at. And, voilà, many of the conversations are on YouTube. Two conversations that aren’t covered in this book but are on YouTube are are TravelMarx favorites are The Philosophy of Language and The Philosophy of Science. After watching these we go to the park to watch the local dog, Giotto(*), chase his tennis ball for something easy on the brain. Okay, this is only our second bike ride (the first was discussed in a previous post) so we are by no means experts but we thought this was a very pleasant little ride. In total we road about 20 miles roundtrip in about 3 hours. We rode “city” bikes on bike lanes in the city which turned into dirt roads along the river as we got further from the city, and finally when the river trail came to an end, SS67 a state highway . We basically headed east, staying on the north side of the river, riding along the river as far as we could until we had to take a surface road. To head out of the city, use the red bike lanes that follow the outline of the old city walls, making a ring around the city. Unfortunately, the path along the river eventually ends, rather suddenly, at what looks like an old mill on the river (near Girone shown with a green dot on the map included with this post). That’s it. You can’t go any farther. So we backtracked a little and got on SS 67 running east. We made it to Sieci and turned around. Riding on SS 67 can be a little nerve racking. But we had had a taste of what a pleasure it would be ride up river into the hills of Chianti. Next time it would be on a 'real' road bike with more than one gear, and of course helmets. Italians drivers seem to respect bikers, allowing a lot of room on the road when passing. The other day we went for a short bike ride and came back hungry and decided to try Le Volpi e l’Uva (the fox and the grapes) just a stone’s throw from our apartment. We’ve heard about it and heard about it, walked by it almost every day, but never went. Boy, we’re sorry we didn’t go sooner. What a treat. Le Volpi e l’Uva specializes in lesser known wines served with a small menu including a cheese plate, a salumi plate, and crostone (a big piece of toasted bread with toppings). Everything was delicious and after three glasses a wine each and four different items off the menu, we were plenty full. We talked with one of the owners who was very nice and helpful and walked out with some nice wine (they sell bottles as well). Le Volpi e l’Uva is located in Piazza dei Rossi which is a tiny piazza adjacent to Piazza San Felicita another tiny piazza. The Vasari corridor runs overhead between the two piazze. The book is called How to Talk about Books You Haven’t Read by Pierre Bayard, translated from French to English. (How could one pass up a book with this title up on the "What’s New" shelf at the British Institute?) The subject is something alluded to in the post about primary and secondary sources, which is how can one possibly read everything one is “supposed” to read? This author puts us at ease and says that you can’t, so don’t try and by the way, “supposed to" is something we need to work on because it’s making us ashamed and flustered – not good. Furthermore, it is okay to not read a lot of books, but still talk about them with confidence. 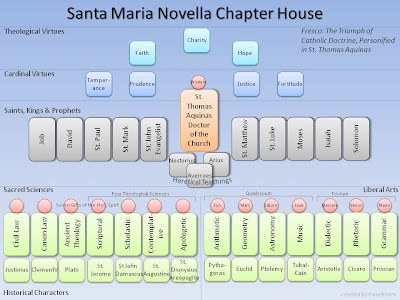 What’s important is to know where books fit into the larger scheme of what he calls the collective library of all books. The advice is a bit more subtle that it seems at first. Bayard’s real goal is to suggest that the highest goal is to transform your relationship with books from feeling burdensome (“I’m supposed to read this”) to being a source of inspiration for your own creativity. He states that talking about books itself is a highly creative activity and that it is important to do so to build your own story. A few sentences from the epilogue state this in so many words: “Becoming the creators of our own works is thus the logical and desirable extension of an apprenticeship in commenting on books we haven’t read. This creativity is one step along the path to self-conquest and to our liberation from the burden of culture, which may impede the existence of those who haven’t been trained in its mastery, and thus in the ability to bring life to their works.” An interesting concept. We were talking the other day to the helpful librarians and instructors at the British Institute about the fresco in the Spanish chapel that we last posted on and they collectively said “oh, that fresco, it’s covered in this book….” Again TravelMarx is the last to know. We’ve updated the picture in that post with some additional information. 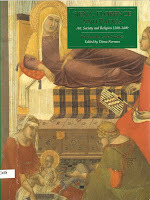 The book that has details on the fresco is called Siena, Florence, and Padua: Art, Society and Religion 1280 – 1300. Volume II: Case Studies. 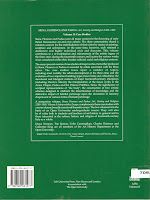 The book is edited by Diana Norman. The fresco is discussed in chapter 10 The art of Knowledge: two artistic schemes in Florence. In this chapter the Triumph fresco is discussed along with the sculpted reliefs on Giotto’s bell tower. Like the fresco, the reliefs provide an encyclopedic view of learning. We had heard that this happens once a year but it caught us by surprise: Toscana Esclusiva – Firenze cortili e giardini aperti. In a nutshell, one can see how the other ½ lives. Okay, less cynically, it means you get to enter for free into a number important palazzi and private villas. The event takes place in Florence and Fiesole on the 11th of May this year. Lucca, Pisa, and Siena open up their historical sites on the 18th, one week later. 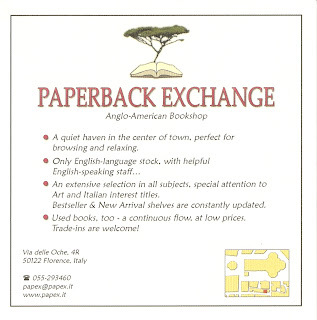 For details see Associazione Dimore Storiche Italiane. When we walked by the first garden on the tour (Giardino Malenchini) and picked up the brochure, we knew we had to see as many as we could. The names and the buildings are so familiar to us by now that getting a chance to walk in through a gate and see the other side is a treat. In a city of walls and gates, like Florence, it can sometimes be frustrating that so much “seems” to be off limits. This is one time to explore even if it is for one day. Giardino Malenchini, via de’Benci 1. It has a nice garden space that looks out on to the Arno. Satellite photo. Palazzo Guicciardini, via Guicciardini 15. For being just steps away from the Palazzo Pitti and off the always crowded via Guicciardini this palazzo’s inner courtyard and garden is like in another world. Very nice. Satellite photo. Palazzo Frescobaldi, via Santo Spirito 13. The garden is a huge open area with beautifully trained wisteria. As well, there are unusual views of the back of back of the church of Santo Spirito. Satellite photo. Giardino pensile di Palazzo Guicciardini, via Santo Spirito 14. “pensile” means hanging or suspended as this garden is sort of suspended over the Arno on the south side. You enter the garden from the south and then climb a small hill to peek over the rail at the Arno. Satellite photo. Giardino Torrigiani, via del Campuccio 53. Who doesn’t want to see this famous garden with the oddly shaped tower set in the middle of huge tract of land surrounded by high walls? Satellite photo. Palazzo Corsini, Lungarno Corsini 10. No garden, but nice huge staircases and chandeliers to gawk at. Satellite photo. There is a lesser known museum called the Museo Storico Topografico “Firenze Com’Era” which translates to the Historical Topographical Museum “Florence As it Was”. If you have been in Florence for a while or you are really interested in what Florence was like before what we see today this is the museum for you. The museum is located at Via dell’Oriuolo 24 – there is a courtyard with large trees that marks the entry point. The museum has a couple of Etruscan items, but Florence wasn’t really an Etruscan settlement, nearby Fiesole was. The museum really starts with the original Roman town founded in c. 59. There is a nice scaled-down version of the first Roman settlement that really gives a sense of how it looked. The bulk of the museum is pictures of what Florence looked like during the ages. We found an old watercolor(?) of “our street” and the famous arches of Via del Canneto taken toward the end of the 19th century (a guess). Included is a recent photo. The view is looking west on Via Canneto. 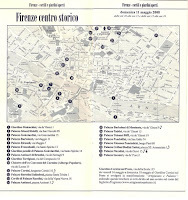 Around town (in major bookstores and book stalls) you’ll find books similarly titled Firenze Com’Era. Each covers a different time period. 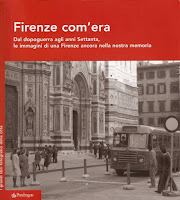 For example Firenze, Com’Era – Dal Dopoguerra agli anni Settanta (Florence as it Was from After the War to the 1970s) or Com’Era – Firenze 100 Anni Fa (How it Was – Florence 100 Years Ago). Obviously the title is a common one, but look before you buy to make sure you are getting the time period you are interested in.